Many Californians are still in disbelief that after five years of too little water during the drought, now the problem is too much water. Heavy winter storms have done more than cause problems at Oroville Dam, where thousands of people were evacuated after erosion of a critical spillway. They’ve also stressed thousands of miles of levees and flood infrastructure downstream of the major dams. Some say it's a wake-up call because the state's warming climate could mean more of the same. With rivers running high, levee patrols have been on high alert for any sign of damage. 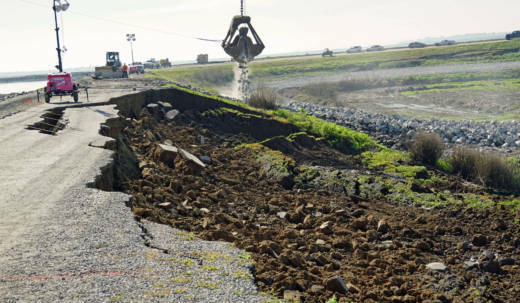 Earlier this month, 60 feet of levee collapsed on Tyler Island, near the town of Walnut Grove in the Sacramento-San Joaquin Delta. 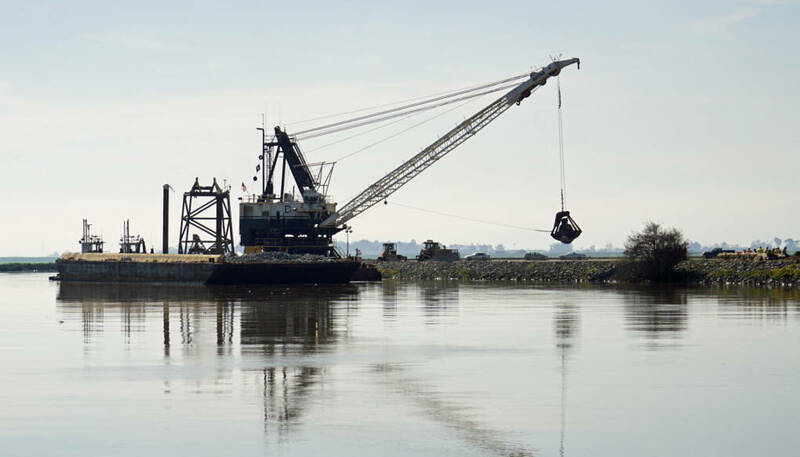 A huge crane was brought in to dump rocks in the gash, in the hope of preventing the river from breaking through. Nearby farms and homes would be underwater without the levee, as the island sits 17 feet below sea level at its lowest point. Mello watched the levee disintegrate in just 15 minutes. Diffenbaugh says while drought and floods aren’t new for California, climate change could make them both more extreme. During wet years, warmer temperatures will cause more precipitation to fall as rain instead of snow. The snowpack is also showing signs of melting earlier. On the contrary, California’s water system was designed a century ago, around having a predictable snowpack in the Sierra Nevada, which acts like frozen reservoir, storing water until the spring. California’s flood system can handle that slow melt, but isn’t really equipped for a huge amount of runoff all at once, Diffenbaugh says. As California’s dams have struggled to handle the influx of winter rain, some are calling for more water storage projects to be built. But even if dams are big enough to capture flood events, the channels below the dams may not be able to handle higher flows. The spillway on Don Pedro Dam near Modesto was opened recently for the first time in 20 years, to prevent the reservoir from overflowing. But the amount of water operators could release has been limited by the capacity of the river channel below it. Dams also aren’t the only option for storing water. “The biggest source of water storage in California is groundwater and it always will be,” says Lund. California has been experimenting with diverting floodwater onto fields, where it can seep into aquifers that were drawn down dramatically during the recent drought. That could potentially allow reservoirs to leave more room in the winter to catch extreme runoff events. “If we’re able to move some of the storage to aquifers," says Lund, "that should free up more storage in the reservoirs to capture that now bigger annual cycle of wet months.". The challenge for improving California’s flood readiness has long been funding. 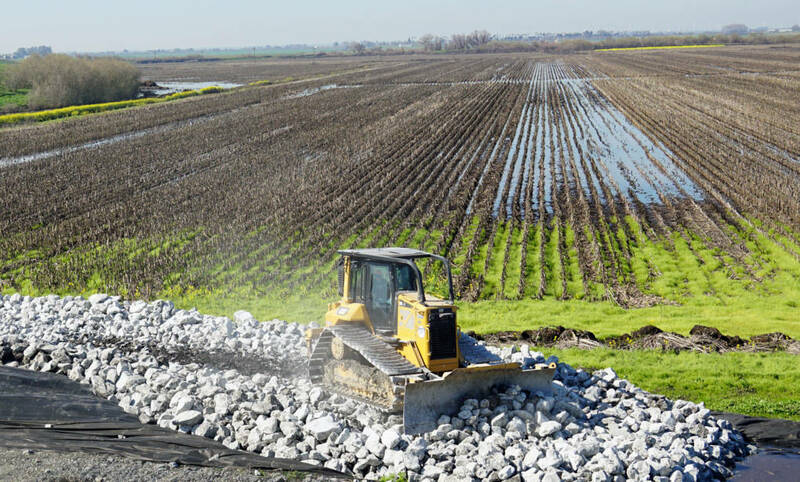 The state has identified billions of dollars of flood control projects and levee maintenance that’s needed, as part of its Central Valley Flood Protection Plan. “One of the big holes in our water system is that we don't have very good regular funding for flood control,” notes Lund. On Friday, Gov. Jerry Brown announced plans to spend $437 million on improving flood infrastructure, with money from a combination of sources, including federal dollars and Proposition 1, which California voters passed in 2014.